Thanks for the info Karen15. How old was your dog when the surgeries were done? Were they done by the vet or a specialist? Hi all, long time reader, first time poster (due to never really having any big issues with my dog). 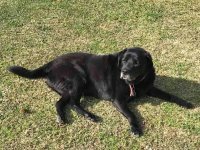 My dog, Simba, is a male 12 and half year old Labrador / Kelpie. He is in really good health otherwise; a good weight, still walks twice a day (slowly), and has enough energy to bark at one of our neighbours most days ;) He has recently had a Mast Cell tumour, Kiupel high grade, removed from his back (just behind his neck) as it had perforated his skin and he was bleeding quite extensively. The Vet's removed the tumour with non-clear margins, an ellipse of the skin 74x46x11mm which beared a well-defined nodule 27x20x7mm. The vet has given us three solid options: a) invasive surgery and chemo (not an option at his age); b) just Chemo; c) no treatment. Stating that he will likely need to be put down after four months with no treatment, and chemo should give him an extra 6 - 12 months (if he reacts well to it). I was wondering the following from anyone who has had a dog with a Mast Cell Tumour (and I invite brutal honesty). a) People's experience with chemotherapy in dogs? Interested in both positive and negative experiences. b) If he reacts badly to one or two chemo treatments and we decide to stop them, thoughts on whether those negative side effects last, or will subside once the treatment wears off? c) I have read a bit on this forum and others about natural therapies. Thoughts on these and weather its worth doing them solo, or complimenting chemo with them? d) Any other feedback in relation to this. Thank you all in advance for your help. Any advice would be a great help to Simba, myself, and my family.